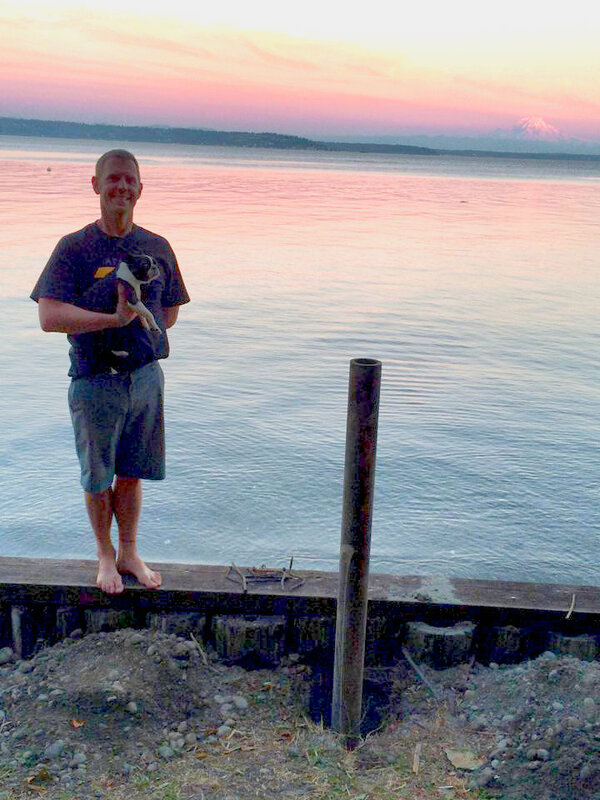 From Arron, his death and now from Jim, I have learned so much about living life. Doing things that scare you, saying "yes" as much as possible, being exhausted in a good way. From Jim, I have learned that some risks are fun and have adventuresome outcomes and some are not worth taking. The trick is knowing the difference. Abigail Carter, author or The Alchemy of Loss and Remember the Moon became a writer as catharsis after her husband's death on 9/11. 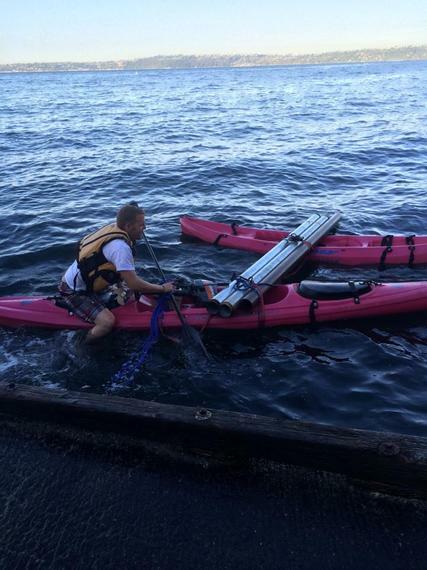 The high tide crashed onto the cement boat ramp as he struggled to strap three 10-foot steel poles and several lengths of rebar to my two pink plastic sit-on-top kayaks. They were the "single mom" kayaks I bought on Craigslist because they were light and I could actually lift them up the steps and onto the rack that held them. I could never have predicted they would be the sort of vessels that would have steel poles lashed to them. The waves kept crashing as I did what little I could to hold the 500 pounds of steel in place without having it land on my toes as Jim struggled to strap everything together. Finally, the new contraption, looking like a lopsided letter H was set and I handed him the small outboard motor and the wooden brace that the motor would clamp onto. I handed him a lifejacket that was too small for him to strap around his chest. He pushed off and floated away, but thirty feet away from the ramp, he had to jump off and hold the "vessel" so it wouldn't capsize in the wake of a passing ferry. He jumped back on and continued his journey of doom. We both knew this expedition wasn't going to end well. I made some new friends near the boat launch who became his rescuers when the 500 pounds of steel and the outboard sank to the bottom of the sound. 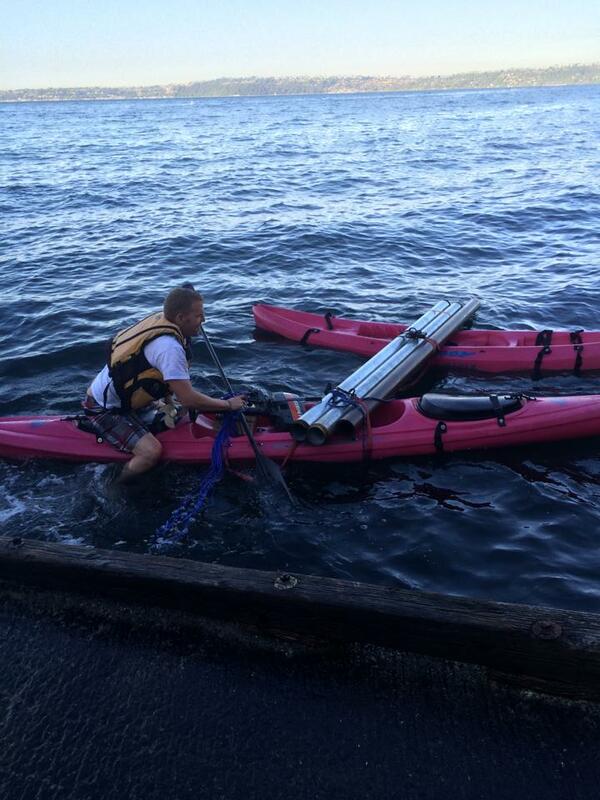 Turns out one of the kayaks was missing a drain plug. There was an early morning low-tide rescue of the motor and later, a lower-tide rescue of the steel. This time it was lashed to the underside of the kayak and rowed safely to our beach in calm water. Of course, all this steel and effort was to build a davit (a hoist) on our bulkhead so his homemade kit seaplane could be hauled onto land whenever he taxis into the beach. Did I mention this is a plane that has never flown? Jim has spent the last year rebuilding the engine, creating cockpit instruments by reprogramming a Kindle Fire, restringing wiring, cutting wing bits out of foam, welding a custom trailer to name just a few of the tasks. With each new plane adventure I wonder how much closer the plane is to actually flying. The adventures make the reality of flight seem far away and yet I am aware that the possibility of Jim flying hundreds of feet in the air in a tiny cockpit is very real. It turns out my boyfriend is a real-life McGyver type. Oddly, I used to think of Arron as a McGyver type as well. I seem to fall in love with guys who do things in unconventional ways. I enjoy being part of the engineering team, trying to figure out angles and weights when trying to figure out how to haul 500 pounds. of steel pipe onto an inaccessible beach. But Arron didn't take risks in quite the same way as Jim. Arron didn't like flying much. Or tall buildings. He wouldn't have skied over a cliff or parachuted out of an airplane. And yet despite his adversity to risk, he died doing something that was supposed to be safe. Ah, the irony. Jim is aware of how his lifestyle might affect my state of well-being. After the kayak incident, he explained that he takes risks on things that have consequences that are acceptable (like losing an outboard in the sound that can then be hauled out, cleaned and returned to full working order). In his work, he sees people on a daily basis who take stupid risks with much higher consequences. Drinking and driving, firecrackers set off in an apartment hallways, driving in the fast lane and texting to name a few. Jim always drives in the slow lane. He's seen too many fast lane accidents and isn't willing to drive in a lane where there is no exit strategy (the shoulder). Despite his job being risky, there are so many safety procedures in place, that at times, firefighters can't even make the rescues they are trained for and have to stand by helplessly and watch as someone meets their fate. And yet a part of it didn't resonate. I am surprised to realize that I don't have the same kind of worry about Jim, which is weird given his lifestyle. I think it's that if Jim were to die, I know I could handle it. I don't want that to happen of course, but I know, deep down that I have the strength to deal with the grief. What I admire most about Jim and his plane and projects and lifestyle is that the man knows so much about living. He never sits still. There is always a project, something new to learn, another problem to figure out. He's almost always exhausted, dirty, covered in cuts and bruises, but these are the effects of living a full life. And yes, living that kind of life involves a certain amount of risk. Phil's death taught me to be a better wife, because I only get one chance to be in this moment, to make amazing memories, to speak kind words, to love people well. Oh what a gift grief is! Learning what it means to be grateful! Us widowed types are probably nauseating to the general public as we run around hugging trees and throwing our arms open to the skies. I know I am a better girlfriend to Jim than I was a wife to Arron because I am just so damned grateful that Jim is in my life. It took so much sadness and grieving and learning how to live again, that so many things that seemed important when I was married no longer do. All the silly things like who's going to clear the dishwasher or who didn't put down the toilet seat or not being home on time for dinner just don't matter anymore. I am happy when Jim's nearby, but don't freak out when he's not. I know he's not far. I know he loves me. From the beginning of our relationship, Jim has assured me he isn't going anywhere and I'm holding him to it. The steel found its way safely to the bulkhead and by sunset was firmly planted into the ground providing the base of what will someday be a davit. It took a lot of effort and some risk to get there, but now that it's there, I know it isn't going anywhere.